Even when I woke up this morning I was not sure that I would make it to the 10K. The family has been hit with the flu in the past two weeks and I had not exercised since two Wednesdays ago. I had only kicked the final bit of the flu — a nasty cough that woke me nightly. I had poor sleep for the past two weeks given that my children were the first to be sick for the first week before I myself succumbed to the bug. I literally thought even in the morning this blog post may very well be about how I didn’t go do the run. My son, on the other hand, had been looking forward to this race with me. I had ran the New Years Eve and New Years Day race without him, and he was very sore about that. Roger made me promise to take him to the next race and that we’d do it together. 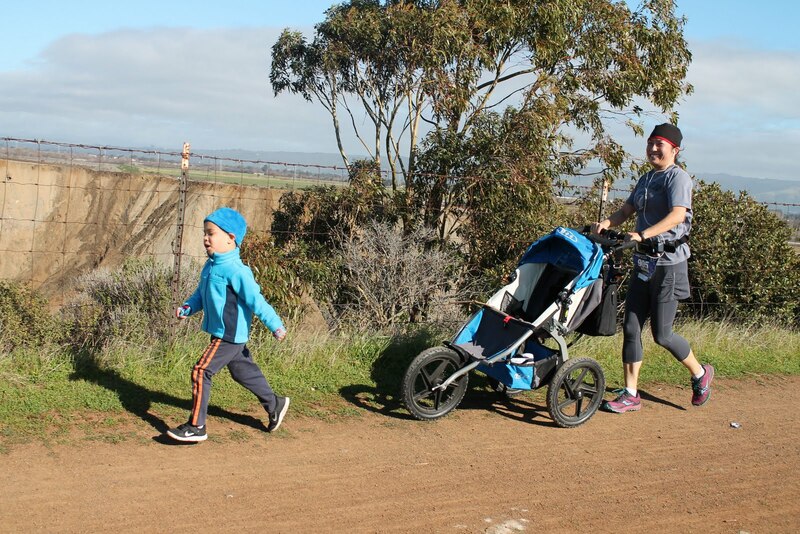 Luckily Coyote Hills, I was told, was stroller friendly. I had not been to this course and I was excited by the prospects of discovering new terrain. Roger was up and at ’em at 7:30am, even before my alarm. We took a while to get dressed, though — I was a bit disorganized and though I was able to get dressed quickly, dressing the boy was a bit more of a challenge. He insisted that I find his hat and sunglasses (smart boy), and in the rush of it all I forgot my own gloves and sunglasses. We drove to the race parking area, which was at the De Vry University campus in Fremont, arriving at 9:10am. We had to wait for a shuttle to get there and I was the only one I saw with a stroller. We had to wait a while for our turn at the shuttle, and I was kicking myself for forgetting my gloves and sunglasses while Roger was so excited to be riding a bus. People were really nice about my dragging a stroller along — a guy even offered to hold it for me at the front of the shuttle as it wasn’t going to fit in the aisle. By the time we got to the race, the 5K had already started. Luckily, I was there just to do it, and time was not really the priority. Plus, there was a timing chip so there was no need to rush, per se. Roger wanted to be on foot but I didn’t let him. I asked him to get in the stroller and we started off on the run. Coyote Hills is a really beautiful course with plenty of watery marshlands and grass-covered hills. Roger had a lot of fun pointing out the water and the ducks there. 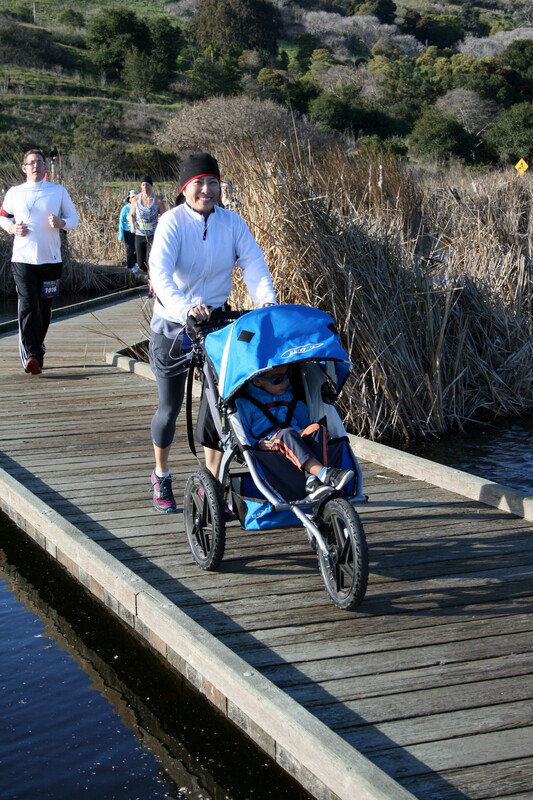 I always enjoy seeing the stroller mommies and daddies on races, and I was glad to see that I was not the only one — I saw a few other moms with strollers and even saw a hot daddy running the half marathon with a jogging stroller with a baby in a carseat! 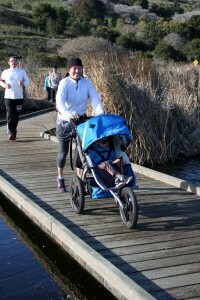 I ran with the stroller and walked intermittently. I was there to push myself only so much — I had only just recovered from the flu and had not exercised for a little more than two weeks so I did lose some conditioning. Roger was really excited by the water and snack stations — they had water, cookies, candies, crackers, bananas, peanut brittles, and oranges, which was a very impressive selection! Around the 3.5 mile, Roger decided he wanted to get up out of the stroller and walk, telling me “Mommy, I want to win and get a medal!” He started to run. I think he might have been the youngest runner there! As he ran next to me, a lot of people would smile and cheer him on. Roger fell on the gravel twice but each time he got right up and said “I’m OK!” and then kept on running. I was super proud of my boy! After Roger walked a bit, he did as any 3-year old boy would do — he picked up quite a few branches and pointed at the sky when an airplane flew by. He also pretende to poke the imaginary fire engine living in the stroller basket to make the stroller go faster. He did get tired and ask for water at around the mile 5 mark, so I suggested that he goes back in the stroller so mommy can run fast and get water. Roger was in the stroller when we crossed the finish line. I was very impressed with Brazen Racing for putting out as many snacks as they did post-race. Roger and I grabbed a few things but it wasn’t until we got in line for the shuttle to go back to our car that we heard announcement for ice cream sandwiches! I was glad that I missed out on that one, personally, but it is a great idea to have them for all the kids! Roger had so much fun on this race he told me we have to do it again soon, and I definitely agree.